My dear, dear friend Nancy writes a blog called: 143 Million Less One. It is about the children in China who are waiting for loving families to adopt them. It is blog about hope and Nancy's mission to bring awareness of these children to the world. Nancy and I found each other over forty years ago on an ice skating rink. Our moms decided we were fledgling ice performers who needed to have our talents showcased in the local skating show. Fortunately, neither of us landed a big role, nor do we ice skate anymore at all. As many of you know, when Mark and I answered God's call back in 2008 to bring our son home from The People's Republic of China, adoption was about the furthest thing from either of our minds. It stands to reason, therefore, that we didn't have the $23K necessary to facilitate his adoption just laying around under our mattress. We did, however, make the choice to step out in radical obedience, humbling ourselves before the Lord and placing our total trust in Him to provide whatever resources we needed in spite of our limitations. With the support of family, friends and total strangers we did a lot of fundraising and in the end, God was faithful to meet us at the point of our every need on that long road to China and back. 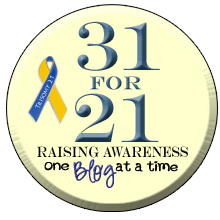 That having been said, I consider it to be a blessing to be able to use whatever platform God has given me through this blog to advocate on behalf of other families working through the fundraising aspect of the adoption process . . . Which brings me to the beautiful little boy in the photo to the left. "Danil" as he is known, is currently waiting in an Eastern European orphanage while his family works tirelessly to complete the mountains of paperwork necessary to bring him home. What makes this family's story so unique, is how God has so perfectly orchestrated the events of their lives to prepare their hearts to include the adoption a very special little boy a world away with Down Syndrome. 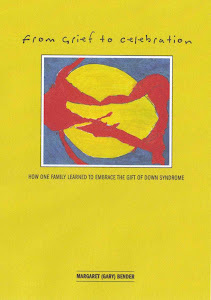 You see, Bryan and Laurie are the biological parents of three energetic little boys, the second of which was born to them with Down Syndrome five years ago this April. As stated in their own words upon receiving the news of their son, Chase's Downs . . .
"Our walls came crashing down and we felt alone and confused and were left asking God the question: Why us? This wasn't supposed to happen. But then again, when we were least expecting it, we found out that having a child with Down Syndrome didn't make life horrible. It made it better. We learned to slow down. We learned (and are still learning!!) acceptance and compassion and unconditional love. We learned determination from a boy who took 23 months to take his first step and three minutes to figure out how to climb from the chair to the counter to get to the cookie jar. We learned to celebrate everything and to wear our emotions out in the open where they belong"
I don't know about you but I am in awe of a God who can transform a question like, "Why us?" and turn it into "Give us more of this blessing, Lord!" I am in awe of a family who is willing to make one more place at the supper table for a little boy who has already been counted among the worthless. 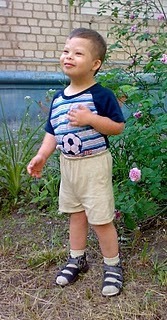 I invite you to please pray about how you can make a difference in the life of this very special little boy by making a tax-deductible donation via credit card or PayPal through the International Down Syndrome Adoption Ministry, Reece's Rainbow at http://reecesrainbow.org/sponsormaddex Please be a part of the blessing and help bring Danil home! Danil has been one of my favorites on RR for a while now. I'm thrilled to know he'll be home with his family soon.